Clinicality Press Keep on Grinding…. December 22nd 2014 will see debut novel by Clinicality Press co-founder Stuart Bateman hit the virtual shelves. Clinicality Press, the home of clinical brutality, follow the publication of their second flagship anthology, ‘Clinical, Brutal 2’ with ‘Grind’, the debut novel by co-founder Stuart Bateman on 22nd December. While he’s been content to lurk in the shadows since Clinicality Press was founded in 2008, contributing only to the two anthologies and ‘C.N.N.’ (2008) in collaboration with Christopher Nosnibor, Stuart Bateman hasn’t been idle, and Clinicality are now proud to unveil ‘Grind’, an incisive critique of life in the 21st century. The book will first be published as an ebook via Smashords and available through Barnes & Noble’s Nook and Apple’ iBooks, amongst a host of major on-line outlets. A Kindle edition will follow later, with a print edition planned for early 2015. 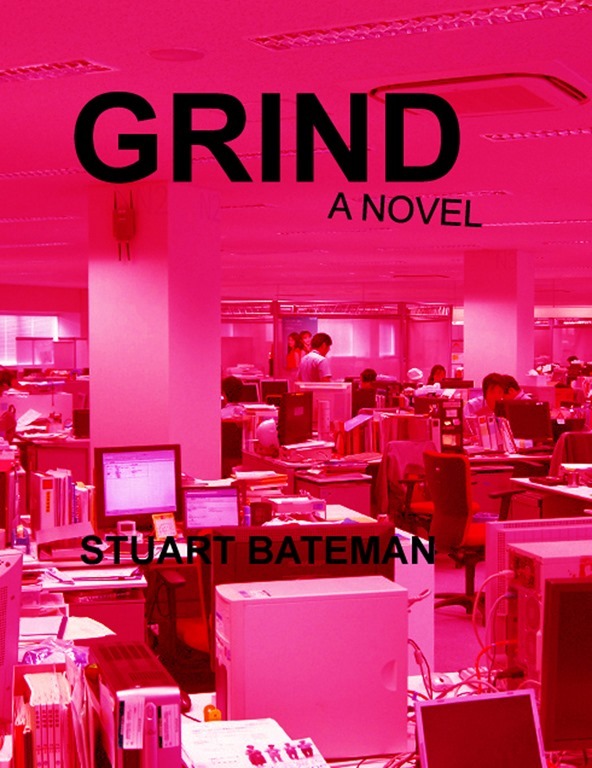 Grind follows in a number of contemporary traditions: the blank novel, the depressive realism of Michel Houellebecq, the office novel (as exemplified by Matt Thorne’s 8 Minutes idle) and echoes works such as Perfect Tense by Michael Bracewell. On the face of it, the narrative that follows Adam Johnson, an office worker in his mid-30s in a mundane low-level management position at a corporate giant, is neither clinical nor brutal. But Bateman amplifies the drabness of existence and amplifies it with a rare and elegant intensity to forge a work that dissects the grim realities of modern life with a sharp scalpel of existentialism. It’s a book that simultaneously celebrates boredom, and as such belongs to the domain of Lee Rourke’s The Canal, but at the same time paints a bleak portrait of life in late capitalist culture that belongs less to fiction and more to the domain of cultural commentary. As such, Grind inverts all literary conventions when it comes to the notion of lead character and supporting cast, suspense, drama and character development. Instead, what Grind presents is not a work of fiction but a slice of life under late capitalism. Stuart Bateman is a quiet, shy and retiring born in Lincolnshire in 1975. His creative interests are diverse, although he tends to operate as a facilitator and behind the scenes technical advisor and refuses to engage in social networking. To date, his published works are C.N.N. (with Christopher Nosnibor) and pieces featured in the two Clinicality Press anthologies. He’s working with Karl Van Cleave and Vincent Clasper on a collaborative multimedia project scheduled for publication in 2015. Grind is his debut novel. Clinicality Press is a small, zero-budget publishing house based in the UK dedicated to the publication of non-mainstream books. Clinicality Press is the leading publisher of works that espouse clinical brutality, as its two flagship anthologies, published in 2010 and 2014 illustrate. This improbable genre – a hybrid form combining ultraviolence with medical terminology and precision – was conceived around the turn of the millennium by Christopher Nosnibor and Stuart Bateman, although it took them until 2008 to assail the world with their vision for ‘writing for the post-CSI generation’. Although Clinicality’s emphasis is cutting-edge, postmodern and avant-garde works of fiction, our aim is to publish and promote the kind of texts most other publishers won’t touch.